Face the target. Your hips and torso should be square to the target, not at an angle. Position your feet about shoulder-width apart, toes pointing straight at the target. Bend your knees a little. Knees should NOT be locked. Bend forward at the hips a little until your weight is on the balls of your feet. 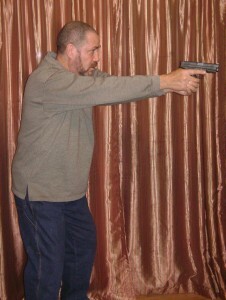 Extend your arms straight-forward holding the gun in a good two handed grip. Your arms should be straight, but not locked out in front of you. In a correct stance, your eyes should now be about level with the top of the gun. It should be easy to find the front and rear sights and the target visually. It is important to bring your arms UP to eye level rather than hunching your head down to bring your eyes down to the top of the gun. Don’t bend your head or raise a shoulder. This throws your body out of the nice, squared up isosceles alignment. Don’t lean backward. Your balance should be on the balls of your feet, not your heels. Leaning backward from the isosceles stance is called the “banana stance” because of how it looks from the side. You will be tempted to lean back into the banana stance because it is natural to want to move your face as far away from the explosion as possible. But your arms are no longer leaning back than they are leaning forward. So leaning back does not get your face further away from the gun. On the other hand, leaning back into a banana stance makes it very hard to shoot accurately. 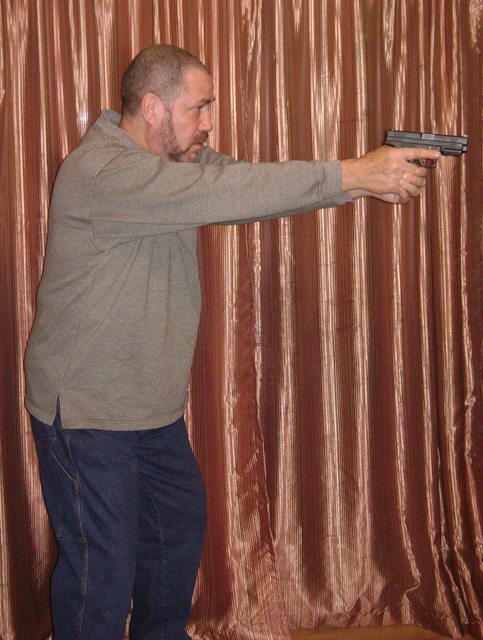 Plus, in a self-defense situation, leaning back puts you off balance from the start. If a bad guy closes with you, you will fall backwards with the slightest push from him.